Pennsylvania has been kicking around various ideas to either provide relief from or totally eliminate local school property taxes for nearly 40 years. SB/HB 76 is the current legislation that, while potentially close to passage as the result of unrelenting textbook grassroots support over many years, falls short on several accounts. In what follows I’ll attempt to explain and offer an alternative. Funding schemes have created wild distortions in the ratio of local to state funding obligation across our 500 school districts, aided significantly by a hold harmless provision, whereby districts in attendance decline cannot have their state funding cut back. District obligation of funding ranges from less than 40% to over 80%. Spending per student is wildly disparate also, ranging 3 times, from about $10,000 to about $30,000. Some districts run a tight ship while others simply spend too much. The number of districts itself cannot help but create areas of advantageous and very difficult tax bases, from which to derive sufficient funds locally. The impact of the local obligation thus varies considerably across the state for different reasons. Generally, citizens who have benefited by hold harmless are not complaining. Others in high growth areas or that have overspent, reside within a challenging tax base, or for whatever reason, have faced school property tax hikes that have far outstripped inflation. In the most extreme examples monthly school property tax obligation exceeds the mortgage payment, and homes have become hard to sell while falling in value as demand has been driven away. Some people have been forced to sell to avoid foreclosure and others driven into it by inability to pay surging property taxes. It is this extreme, down to where it doesn’t hurt so much, that has driven a powerful, centrally led, unusually well organized, grassroots push to totally eliminate the school property tax. Sadly, the fervor of the school property tax elimination movement, has crowded out serious discussion of alternatives or sufficient questioning of what could go wrong, to the point that individuals and groups in opposition have mostly maintained that position quietly, to not offend those they normally find allies on liberty and limited government issues. Departures have even been met with threats and ridicule on occasion. What follows will risk that wrath. So what are my objections to and problems with this popular legislation? First, the problem has not been accurately defined. All areas of the state don’t favor the huge tax shift that would be necessary with 76. They’re satisfied with the status quo, suggesting the property tax is secondary to the undeniable problem of the amount of the school property tax in some areas. There appears to be an amount of school property taxation below which it’s not worth making a fuss. Make no mistake. Any substantial tax on real estate has problems, chiefly that it’s difficult to apply fairly, but goes beyond that. While real estate is no more property than the money in a paycheck exchanged for labor, or the money withheld from a paycheck (that makes us treat it too lightly), it represents accumulated wealth, income that’s survived ongoing expenses, wealth that has been purposed by choice, often is near term illiquid, and has uniquely acquired sentimental value over time. Then that same wealth, apart from any current ability to pay, is repeatedly taxed over and over again. It’s a form of wealth that is not regularly priced to market as stocks or bonds. Its value and revaluation by costly reassessment is an educated guess beyond its last known sale price at market. Some people regularly challenge assessments and others regularly evade permits when making improvements, adding to the unfairness in application. Yet local taxing authorities rely on the relative stability of the property tax in fluctuating economic conditions, to ease budgeting. Another problem with the local school property tax elimination scheme is its shift of all funding to the state. On many occasions I’ve asked local elimination supporters if they would favor shifting all school funding to the Federal level. I’ve never gotten one expression of agreement. They know control would go to the source of the funding, yet are so frustrated with high and rising school taxes they are willing to let the state take over all funding, risking any impositions it may bring. They make the argument that local districts no longer maintain local control anyway, due to various state and federal mandates. When I see my local board discuss whether to field a football team, the need to replace the turf, build a new running track, repair a building, sell a building, build a building, decide what instructional materials to use or how much to pay employees, I know this is not true. I expect there would be less happiness after passing 76, when the state announces all will use the same books and instructional materials because they can make a bulk purchase or that one union contract and pay scale will apply to all districts, just as the pension agreement. By the promise of 76 to replace all current property tax revenue dollar for dollar, then strictly limit spending increases, by allowing exceptions by local EIT or PIT application, only for specific purposes, for a defined length of time, after approval by no exception referenda, the law seems to place an unfair burden on those who have been most frugal and favor the spendthrifts. As unexpected needs arise the wasteful, at least for some time, will have more wiggle room to make cuts and diversions. Call it an odd blessing of wastefulness. With each district knowing how much funding they will have available without having to ask the taxpayers for more, there will be a force to contain but not cut spending. The motivation may more likely be to make sure every penny is spent so no one suggests sending less state funding in the future. While 76 supporters suppose a great benefit in stripping local elected officials of their taxing authority by bumping the state PIT from 3.07% to 4.34%, while calling a 41% hike modest, and the SUT from 6% to 7% over more goods and services, then shielding those revenues in a lock box, and setting limits on yearly increases, they trust state elected officials to leave everything alone down the road. Future officials could jack up the PIT and SUT, raid the lock box, obliterate the ban on the local school property tax itself, or impose a property tax from the state level. There should either be promise of something wonderful for the risk, or the much higher hurdle of constitutional amendments. Supporters’ belief and claims that the tax money shift would magically cause an economic boom should be approached with extreme skepticism. Almost the same amount of money is removed from Pennsylvania’s private sector economy. A free ride would exist but would be small, from non citizens paying the increases in the SUT while visiting or passing through. There are winners and losers. Accepting claims property values would jump 10% or more is good for people who own property, or realtors’ commissions, but it heightens the barrier for young people saving for a down payment, after being impacted by a 41% hike in the tax on their income and paying higher taxes when they make purchases. Big winners are retired people whose spending needs are less and face no state tax on pension income. We should have been curious along the way, why professional conservative organizations have never been more than neutral with their positions on 76. If there was confidence 76 would yield the economic boom predicted, based on sound academic study produced by their extensive research staffs, it’s hard to believe organizations like Americans for Prosperity, Commonwealth Foundation, NFIB, or the PA Manufacturers Association would not have been solidly in support. 76 is not without risks and even supporters admit it is not perfect legislation. The amount of the tax shift to replace all money raised by local property taxes now is close to $14 billion. One nagging question remains. Why do liberty minded, limited government types, especially at the forefront of promoting 76, on this one issue, submit to entrusting government at a higher level, more distant from the people? So, if not 76, then what? To start, I agree with 76 supporters that any scheme to offer school property tax relief without total elimination risks return of even higher taxes locally and overall in the future. Further the distortions caused by hold harmless need to be eliminated by whatever change is made to the current system, and if not done at once, likely will remain forever. Assuming the core local funding (apart from spending) problem really lies in the ratio of state to local funding responsibility, with the property tax itself a secondary but important issue, the first step should be to more equally distribute state to local funding by defining the ratio. The local districts, for their part, would be free to spend whatever and however they see fit. But if districts completely control spending, and the state commits to a defined funding obligation, isn’t that crazy? It certainly could be. To avoid that obvious hazard, districts should be empowered with a moveable state to local funding ratio they can control, to or against their favor, depending on how much they actually spend per student relative to their peers. While they are free to spend as much as they want, as spending per student rises relative to other districts, funding for that portion of spending shifts rapidly and heavily to local responsibility. Heavy spenders could not expect to impose their largess on others. This would force attention to the margins of local spending choices, by a realization that each district is in competition with others to not just contain but reduce spending and become more efficient. Its integrity could only be confounded by the improbable collusion of all 500 districts with each other. I’ll note here that this proposal will require some small immediate tax shift to state PIT and SUT, but far less than the massive shift required by 76. The goal is to more equally share state and local funding obligations, then keep it that way, as defined by a funding ratio statute. 1) Rank all 500 districts by actual total spending per student as determined by average daily enrollment, or preferably, average daily attendance. This means any district keeping spending per student below the 60th percentile would only be responsible for 40% of its funding. The ratio of state funding responsibility is purposely tilted toward the low end, with the idea of elimination of some of the dubious factor adjustments for items like number of English as a second language students or free lunch eligibility, etc. that are applied today. 3) Give districts much more leeway in how to meet their local obligation by options to shift away from the traditional assessment based property tax. Such may include EIT, PIT, sales tax, flat per capita tax, flat per registered vehicle tax, higher real estate transfer tax, or even property taxation that is always based on the last known value established by the purchase price at market, thus eliminating assessments, with only one exception, for sales among friends or family, at below the true open market price. 4) Provide an opportunity for districts to slightly shift their funding obligation onto the current users of the system by allowing a charge of up to 3% of their total spending per student as a per student tuition. This small imposition of ownership, “skin in the game”, so to say, would likely provoke very significant response expressed as more pressure on elected boards to find efficiencies. 5) Investigate consolidation of districts to average the effect of pockets of poor tax bases across wider geographic and economic areas. That’s the concept. Yes, it requires a certain leap of faith, but confidence in its viability is vested in the predictability of how people react to properly presented economic incentives and constraints when making free choices in their self interest. Competition is key to achieving a spending and funding scheme that is both self limiting and self regulating, while allowing free choice and government that resides close to the people. 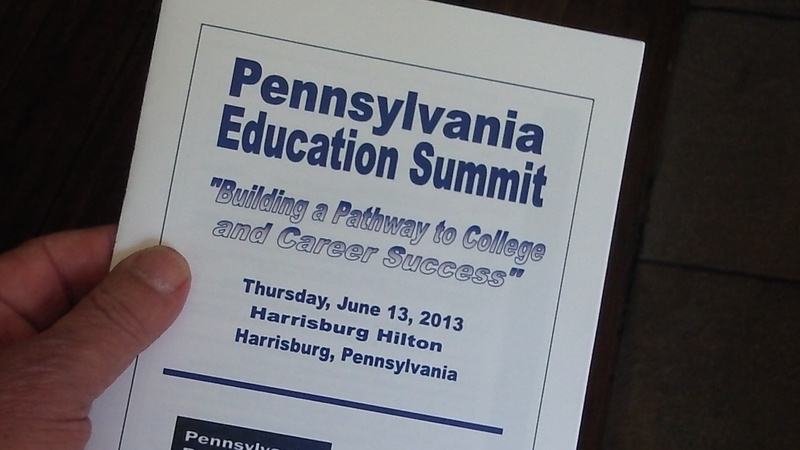 On June 13 of this year the Pennsylvania Business Council along with Pennsylvania Partnerships for Children and Team Pennsylvania Foundation hosted the Pennsylvania Education Summit, using the tag line “Building a Pathway to College and Career Success”. For anyone interested, I created a scrolling video record of all tweets using the suggested hashtag #PaEdSummit, as a collection of observations of the many in attendance. I thought maybe a summit would be just that, an event defining problems and seeking answers, from many ideas and points of view. Indeed it did define problems, but then focused nearly entirely on one answer, the Common Core Academic Standards. I was attending a Common Core love fest. While I’ve learned more about Common Core and its origination and distribution since the summit, I knew enough at the time to know what I saw as dangerous and offensive to freedom, and had doubts that Common Core is even working on the right problems that are causing agreed failures in our schools. First, dangerous and offensive: Putting together Common Core involved large sums of private money, reportedly $150 million alone from Education Summit sponsor Bill & Melinda Gates Foundation, and was written by a handful of elite authors. The Federal Department of Education presented states “offers they could not refuse” in Race to the Top money and No Child Left Behind waivers to get almost all (45) states to agree to the new standards in short order, as few people noticed. If only we trust in the wisdom of these changes and align as one, this new effort at central planning will solve our problems as previous efforts, going back to Outcomes Based Education have not. Just have faith. But isn’t this the adoption of a monopoly of ideas so heavily invested failure will not be tolerated, continuing and intensifying pressures that have resulted in test answer changing scandals that even had Michelle Rhee refusing to answer questions? Is it not also a dangerous path where large moneyed private interests can, in effect, set public policy without the consent of the elected representatives of the people? Isn’t education better left without the involvement of the federal government, where states can be the laboratories of innovation? Hasn’t education , if anything declined in quality since a stand alone federal Departmant of Education? And since when do Americans align? Americans innovate and break molds and build new ones in searching out opportunity and success. The summit wasn’t about consideration of any of these issues or ideas. From time to time I injected my counter views and concerns into my tweets, but they were never acknowledged in the presentation. Finally in the last panel, state Senator Mike Folmer raised the issue of support in the home, that no new plans at the top are as important or necessary as supportive homes. It was the stimulus I needed and I went to the microphone for Q&A with an infusion and intrusion of counterpoints and opposition. I acknowledged the description of problems and good intentions then challenged the panel to tell me why Common Core is the magic elixir that will bring success as previous attempts have failed. I made the suggestion that other factors may be at work, as time has changed many things in our society, such as the advent of poor public policy in the area of social welfare that has provided perverse incentives toward single parent households, as well as the necessity for many two worker households, where neither parent has enough rested time with their children. Seeming to support this possibility was an admission from the President of Elizabethtown College that our failures are concentrated in our 30% worst performing schools, without which we would compare favorably with the best in the world. For that we seek to impose expensive cumbersome changes on everyone instead of focusing on the 30%? I acknowledged the comment of Senator Folmer and as a specific example, spoke of a young Dr Benjamin Carson and how only a caring uneducated and probably illiterate mother who demanded reading books over watching TV was the determining factor in removing him from a path to failure; how then when he felt empowered by and accepting of reading, it was in that moment that a future successful pediatric neurosurgeon was born. These were questions and considerations not included in the agenda of this summit. As the panel was, what I felt, mostly dancing around my concerns in their response, I readied for my finale, three words in closing: choice, vouchers, and competition as the proven market approach that would likely do the most to improve all our schools, building a floor for quality and value in its process. As the moderator went into wrap up mode I knew I wasn’t going to get the chance. I decided to leave before the 15 min ending “Where do we go from here?” message. On my way out I was stopped by Mr David Patti, President and CEO of the Pennsylvania Business Council. He most graciously thanked me for attending and suggested this is one issue on which we don’t agree even as he appreciated my remarks. I told him about the three words I had wanted to say. When Mr Patti looked at me and said that the Business Council favors that also I was befuddled and remain so to this day. Central planning and market solutions are at opposite ends of the Conflict of Visions described by Dr Thomas Sowell in his 1987 classic work. Attempting to entertain both, in my opinion, is an internal conflict for those who try, and I am left puzzled when business people do not look first and foremost to the marketplace as the source of innovation and solutions that has consistently made America the envy of the world. The experience reminded me of a similar situation, in which the Pennsylvania Chamber of Business and Industry took a position favoring Pennsylvania’s setting up a state run Obamacare exchange. Despite phone conversations, emails and references to articles by Cato and others, I was never able to convince Chamber Chairman and CEO Gene Barr to end that support and back concepts to incentivize state employers to embrace high deductible health plans and health savings accounts, with their connection to market forces. In talking to Mr Barr at the Education Summit he still defended state exchange support. More than Common Core and more than healthcare I sense a disturbing trend inside the business community to not embrace and show unwavering faith in free markets over government schemes, especially central government impositions. Yet then there are others like NFIB or the Pennsylvania Manufacturers Association who are more consistently standing up for freedom. In these times everyone must be standing on the side of freedom. In one final note StudentsFirst.org was also a sponsor of the Education Summit. This is Michelle Rhee’s creation and sits firmly in the unconstrained (Sowell) vision, accepting of elitists among us capable of divining solutions for the rest. In keeping Common Core under the radar as long as it was, it seems curious, significant and deliberate that Rhee’s February 2013 book “Radical…” does not mention Common Core even once.